So it’s here at last! My second novel is on the shelves, both real and virtual, for people to read. Publication day is always exciting. Seeing your book in all its glory with that shiny cover and inviting blurb is an emotional moment. Finally the novel you been working on for the last year or longer, is out there. But of course as well as being a day of celebration it is also a day of apprehension. Will people like what you have written? Has all the research and painstaking editing paid off? Does the story hang together? Are the characters that you have created with such care, as real to other people as they are to you? Authors never really know the answers to those questions. All we can do is hope that we have done enough for the answers to be yes. 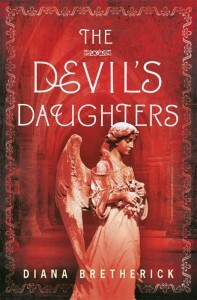 I hope that you will enjoy reading ‘The Devil’s Daughters’ as much as I enjoyed writing it. Now it’s time to turn to the next novel. In fact I’ve already started it and I’m busy greeting old characters, meeting some new ones and creating more fiendish crimes to be solved.